Heritage of the Auvergne volcanoes bequeathed to the former Rouergue region, the Aubrac plateau stretches over the southern Massif Central straddling the departments of Aveyron, Lozere and Cantal. At an altitude ranging from 1000 to 1400 meters, its climate is typically mountain-like, with long, harsh winters punctuated by sometimes very heavy snowfalls. Its landscapes alternate between extensive pastures and deep beech forests. An eternal nature still prevails endowingit with an exceptional floristic richness with more than 1000 species of plants, some of which are very rare. · Industrial, with mechanical adjustment andengraving and an assembly line. · Traditional, because all the steps of assembly and adjustment arecarried out by one and the same artisan: hand decoration offorged springs and fixing by sight (thus, each piece that goes through the hands of the craftsman is unique). To make sure of the authenticity of a Laguiole, check the exact provenance, the length of the guarantee, the quality of the materials and of the finishing touches. 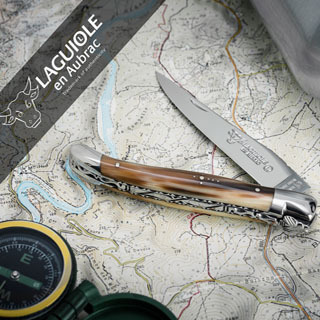 There are many low quality imported products that sell with a "Laguiole Véritable (True Laguiole)" stamp.